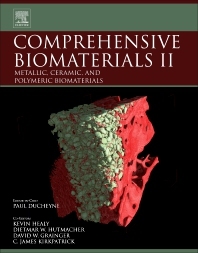 Comprehensive Biomaterials II, Second Edition brings together the myriad facets of biomaterials into one expertly-written series of edited volumes. Articles address the current status of nearly all biomaterials in the field, their strengths and weaknesses, their future prospects, appropriate analytical methods and testing, device applications and performance, emerging candidate materials as competitors and disruptive technologies, research and development, regulatory management, commercial aspects, and applications, including medical applications. Detailed coverage is given to both new and emerging areas and the latest research in more traditional areas of the field. Particular attention is given to those areas in which major recent developments have taken place. This new edition, with 75% new or updated articles, will provide biomedical scientists in industry, government, academia, and research organizations with an accurate perspective on the field in a manner that is both accessible and thorough. Paul Ducheyne is Professor of Bioengineering at the University of Pennsylvania, Philadelphia, USA, and a member of the Institute for Medicine and Engineering (IME) and the Center for Engineering Cells and Regeneration (CECR). Paul's research is focused in the investigation of mechanistic effects of materials on cellular functions, specifically cell attachment, proliferation, differentiation and extracellular matrix formation, especially with respect to biomaterials and tissue engineering. His lab works extensively with the interface zone between materials and cells and tissues, using both materials science techniques as well as life science methods. In addition, studies focus on the combined effects of microgravity and substrate material on cellular functions and on material surface modification and controlled release of growth factors. Several tissue engineering applications are pursued with orthopedic and dental applications. Specifically, his laboratory studies whether bone defects can be repaired with full return of mechanical function by treating defects with in vitro synthesized bone tissue. Kevin E. Healy, Ph.D. is the Jan Fandrianto Distinguished Professor in Engineering at the University of California at Berkeley in the Departments of Bioengineering and Materials Science and Engineering. He received a Bachelor of Science degree from the University of Rochester in Chemical Engineering in 1983. In 1985 he received a Masters of Science degree in Bioengineering from the University of Pennsylvania, and in 1990 he received a Ph.D. in Bioengineering also from the University of Pennsylvania. He was elected a Fellow of the American Institute of Medical and Biological Engineering in 2001. He has authored or co-authored more than 200 published articles, abstracts, or book chapters which emphasize the relationship between materials and the tissues they contact. His research interests include the design and synthesis of biomimetic materials that actively direct the fate of embryonic and adult stem cells, and facilitate regeneration of damaged tissues and organs. Major discoveries from his laboratory have centered on the control of cell fate and tissue formation in contract with materials that are tunable in both their biological content and mechanical properties. These materials find applications in medicine, dentistry, and biotechnology. He is currently an Associate Editor of the Journal of Biomedical Materials Research. He has served on numerous panels and grant review study sections for N.I.H. He has given more than 200 invited lectures in the fields of Biomedical Engineering and Biomaterials. He is a named inventor on numerous issued United States and international patents relating to biomaterials, and has founded several companies to develop materials for applications in biotechnology and regenerative medicine. Distinguished Professor Dietmar W. Hutmacher is the Director of the Centre of Regenerative Medicine and Director of the Australian Research Council Centre in Additive Biomanufacturing at the Queensland University of Technology (QUT). He holds a MBA from the Royal Henley Management College and a PhD from the National University of Singapore. His career so far has included extensive work in research and industry as well as in education and academia. Hutmacher has expertise in biomaterials, biomedical engineering, and tissue engineering & regenerative medicine (TE&RM), and is also among the pioneers in the field of 3D printing in Medicine. He has published more than 250 journal articles, 24 book chapters, and 10 edited books. In 2012 he was elected to join the highly esteemed International College of Fellows Biomaterials Science and Engineering, and to become one of the 23 founding members of the International Fellows of Tissue Engineering and Regenerative Medicine Society (TERMIS). In 2013, he received the highly prestigious Hans Fischer Senior Fellowship from the Technical University in Munich. He has been an Adjunct Professor at the Georgia Institute of Technology for over a decade. Serving on the editorial boards of leading journals in his fields, Hutmacher maintains strong relationships within the global biomaterials, TE&RM and cancer research community. Over the last 18 years, he has been invited to give more than 50 plenary and keynote lectures at national and international conferences, has served on 30 organising committees for international conferences, and chaired more than 80 sessions. A number of medical device and tissue engineering projects have been patented and commercialized under his mandate, and he is a founder of 5 spin off companies. David W. Grainger is the George S. and Dolores Dore´ Eccles Presidential Endowed Chair in Pharmaceutics and Pharmaceutical Chemistry, past Chair of the Department of Pharmaceutics and Pharmaceutical Chemistry, and Chair and Professor of Bioengineering at the University of Utah, USA. Grainger received his Ph.D. in Pharmaceutical Chemistry from the University of Utah in 1987. With an Alexander von Humboldt Fellowship, he undertook postdoctoral research in biomembrane mimicry and assembly under Prof. Helmut Ringsdorf, University of Mainz, Germany. Grainger’s research focuses on improving implanted medical device performance, drug delivery of new therapeutic proteins, nucleic acids and live vaccines, nanomaterials interactions with human tissues, low-infection biomaterials, and innovating diagnostic devices based on DNA and protein biomarker capture. He also has expertise in perfluorinated biomaterials and applications of surface analytical methods to biomedical interfaces, including surface contamination, micropatterns, and nanomaterials. Grainger has published over 190 research papers at the interface of materials innovation in medicine and biotechnology, and novel surface chemistry. He has organized many international scientific symposia and chaired the Gordon Research Conference in Biomaterials and Tissue Engineering. He frequently lectures worldwide, including delivering many named, keynote, and plenary presentations. Grainger serves on the editorial boards of four major journals in the biomedical materials field. He is currently a Council member at the National Institutes of Health, and has served on many national and international review panels, including the NIH’s Surgery and Bioengineering and Emerging Bioanalytical and Imaging Technologies Scientific Review Groups. He remains active on academic scientific advisory boards for diverse academic programs in the United States, Asia, and Europe, including major research centers at the Universities of Wisconsin-Madison and University of Washington, the AO Foundation and EMPA, Switzerland, the Charité, Germany, several other competence centers in Europe.. Grainger also sits on the scientific advisory boards for four biomedical companies and actively consults internationally with industries in applications of materials in biotechnologies and medicine. His scientific and technical accomplishments are widely recognized, both at his institution and worldwide. Among several citations, Grainger is fellow of the American Association for the Advancement of Science (AAAS), the American Institute of Medical and Biological Engineering (AIMBE), and the International Union of the Societies of Biomaterials Science and Engineering. He has also been honored with the 2007 Clemson Award for Basic Research, Society for Biomaterials, and the 2005 American Pharmaceutical Research and Manufacturer’s Associa- tion’s award for ‘Excellence in Pharmaceutics’. C. James Kirkpatrick is Emeritus Professor of Pathology at the Johannes Gutenberg University of Mainz, Germany, having directed the Institute of Pathology from 1993-2015. Currently he is Senior Professor in the Cranio-Maxillofacial Surgery Clinic at the Goethe University of Frankfurt & Visiting Professor of Biomaterials & Regenerative Medicine at the University of Gothenburg, Sweden. He is also Honorary Professor at the Peking Union Medical College, Beijing and the Sichuan University, Chengdu, China. Kirkpatrick is a graduate of the Queen’s University of Belfast and holds a triple doctorate in science and medicine (PhD: 1977; MD: 1982; DSc: 1992). Previous appointments were in pathology at the University of Ulm, where he did postdoctoral research in experimental pathology, Manchester University (Lecturer in Histopathology) and the RWTH Aachen (Professor of Pathology & Electron Microscopy). On moving to Aachen in 1987, he established a cell culture laboratory which began using modern methods of cell and molecular biology to study how human cells react to biomaterials. Since then, his principal research interests continue to be in the field of biomaterials in tissue engineering and regenerative medicine, with special focus on the development of human cell culture techniques, including novel 3D coculture methodology for biomaterials and the application of modern molecular pathology techniques to the study of biofunctionality of biomaterials, including nanomaterials. Kirkpatrick is author/coauthor of more than 500 publications in peer-reviewed journals and has given more than 500 invited presentations to scientific meetings worldwide. He has an H-index of 58 (Web of Science) and 68 (Google Scholar) and has been cited more than 17.000 times. He is a former president of both the German Society for Biomaterials (2001–2005) and the European Society for Biomaterials (2002–2007) and served on the ESB council from 1995-2013. He was also a member of the Council of the European Chapter of the Tissue Engineering & Regenerative Medicine International Society (TERMIS-EU; 2006-2008; 2010-2012). Kirkpatrick was a long-standing member of the editorial board of the premier journal Biomaterials (1996-2014) and also associate editor (2002-2014). He has also served as associate editor of the leading Journal of Pathology (2001–2006). In total, he serves or has served as an editorial board member of 18 international journals in pathology, biomaterials, and tissue engineering. Kirkpatrick was the Scientific Programme Committee Chair for the 8th World Biomaterials Congress in Amsterdam in 2008. Kirkpatrick is a member of the Scientific Advisory Board of a number of research institutes, centres of excellence and companies in biomaterials and regenerative medicine in Europe, as well as the Medical Technology Committee, Federal Ministry of Education & Research in Germany (BMBF) (2005-2008) and the German Federal Institute for Drugs & Medical Devices (BfArM)(since 2007). Kirkpatrick has been recognized for his contributions. He is a Fellow of the Royal College of Pathologists, London and a Fellow of Biomaterials Science & Engineering (FBSE) of the IUS-BSE (International Union of Societies for Biomaterials Science & Engineering). He received the Research Prize of the State of Rhineland-Palatinate for Research on Replacement and Alternative Methods for Animal Research. He was the recipient of the George Winter Award from the European Society for Biomaterials (2008), and in 2010, he received, as first medical graduate, the Chapman Medal from the Institute of Materials, Minerals & Mining in London for “distinguished research in the field of biomedical materials”. In 2014 Kirkpatrick received the TERMIS-EU Career Achievement Award.